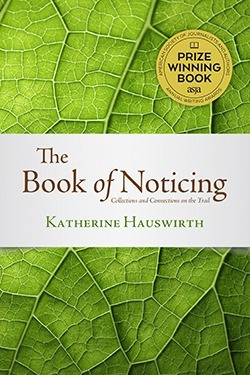 The Book of Noticing: Collections and Connections on the Trail reflects on nature and the human experience. It springs from many long walks, chiefly here in Connecticut. Both paperback and Kindle editions are available. Happily, I learned in January 2017 that one of the pieces in the book, called Beckoning the Mountain, won first prize for memoir vignette in the 2016 Soul-Making Keats Literary Competition! April 6, 2018 update: Honorable mention for my book by the American Society of Journalists and Authors. Please visit the Events tab for information on local readings and workshops. I am happy to give talks and book club visits (including Skype), and I am always happy to sign a copy, if you have a gift for someone special (including yourself!) in mind. Excerpt published in The Day: access here. Here is a Shoreline Times article about the book, and workshops/events. Here is a review in Connecticut Woodlands. Her essays are a reflection of that sentiment. She draws connections between all manner of things: manna and mushrooms, salamanders and prehistoric life, trees and sentient beings. And she proposes that what we care about matters, even if we aren’t full time naturalists or well versed in the habits of bees, birds, or budding trees and flowers. Her essays convey the miracle of vernal pool life, the natural treasures hidden in plain sight, the efficiency of death, the constancy of new beginnings. And she weaves in the ideas and writing of scientists, philosophers, historians, and naturalists to bolster her observations. It’s a beautiful book. It will make any reader want to buy her own pair of muck boots and head out into the world.